Me: Cancer is really hard to deal with mentally and emotionally. Girl I am hoping to relate to: Yeah, I know. You need to talk to your doctor about it. I did and my doctor really helped me. Me: Okay, great! Thanks so much for the advice! So I’ve had several people tell me that if I had to get cancer, thyroid cancer is the one to get. Girl I am starting to relate to: Yeah, that’s true! Girl I no longer relate to: Thyroid cancer is usually pretty easy to treat. Me: (More silence. I don’t know how to respond, so I just move on. )…It scares me to think about how long it’s been in my body. Girl whose face I want to punch in: Oh, it’s been in your body for a REALLY long time. Me: (Sobbing on the inside) You’ve been helpful. Thank you so much. Girl who must not know what cancer is: Call me anytime. Me: You’ve been a real treat. Thanks for making me feel worse than I already did. Needless to say, the phone call was a complete failure. I contacted her looking for community, someone I could relate to, and I didn’t get it. After that phone conversation, I felt like I was the one who was abnormal for thinking thyroid cancer wasn’t easy. I thought I was being irrational for fearing the cancer would take over my body. I needed that girl to validate my feelings, but she didn’t. I never called her again. To not be alone. No crap, Sherlock! Seriously, though, I have learned that I am emotionally and mentally healthier when I know I am not alone in what I’m going through. I need community for my health. To have someone understand me and validate what I’m going through. I need community to tell me my feelings are normal. I need community to tell me I’m not insane! To be encouraged when going through a tough time. It’s comforting to know that when I’m having a hard time, I don’t have to deal with it alone. I need community to lift me up with words of encouragement when living with cancer has me down. To be encouraged when things are going well. I need community on the days when I’m not flipping out about what’s going on inside my body because I need others to appreciate the good days with me. To tell my story and bend an ear to someone else. For me, sharing my experience with cancer is cathartic, and participating in a community gives me the opportunity to share what I’m going through. And if my experience helps someone else, well that’s just icing on the cake. I hope you know this is a great community. Thymmunity, you are welcoming and open. You are non-judgmental. You’re supportive and informative. You’re willing to reach out and carry those who are too tired to keep walking. I really could go on and on, but because you’re so great, I’m leaving you with a call to action. One of our youngest community members (“B”) has thyroid cancer and is facing a hard journey. With external beam radiation and quite possibly chemotherapy in her near future, she needs this community to rally around her and cheer her on as she courageously moves forward with treatment. Let’s bombard her with love and encouragement. Here’s what we at Dear Thyroid want you to do: send “B” a card showing your support and your love. Let her know we’re all in this together. Remind her why she’s fighting. Remind her she’s not alone. We’ll package all the cards together and ship them off to our young thyrella. I know this community will step up in a big way. Let’s show her the power of a unified front. Cancer can do a lot of things, but it cannot destroy this community. What do you look for in a community? How has a good community helped you deal with your cancer/disease? I have put this in my “reminders”. Will pick up a card and get it in the mail tomorrow. Amanda, thank you so much!!! Lots of gratitude to you! you people have been so helpful and insightful in my situation. i was just diagnosed last monday and will be having a biopsy on my lymoph nodes on the 28th and then i go under for the thyoidectomy and removal of the nodule and any lymph nodes that may be affected on 7/13. i know not what the future holds, but i hold you all dear. i hope we can help our friend get through this. i will get a card when i shop on thursday and send it out right away. again thank you ladies sooo much for your kind words and support in my situation, you have a been wonderful. My heart is on fire for you! You guys are the greatest! I LOVE.LOVE.LOVE this SO much. I’m on it! My father is a Thyroid cancer survivor and I have a 28 year old cousin with it right now. I will be happy to send her a card. Thank you, Gina Marie! I’m so very glad you’ve gotten plugged into our community. We’re glad you’re here. We’re here to support you, too, in every single way we can! Keep us posted on your biopsy and surgery. I love this place, too, Melissa!! And you! Thank you, Lori!! You’re a peach! Victoria, thank you so much! I’m so very grateful. How long ago was your dad diagnosed with thyroid cancer? And what about your cousin? Are they part of our community, too? Gina Marie – So sorry about your recent diagnosis. Please keep us posted on the biopsy. If you need any help, support or anything else, please let us know! We’re here for you, love. PS: Thank you so much for sending “B” a card. We’re so grateful. You take care of your sweet self, and please, please, please do not forget to keep us posted. Melissa – You’re super fabulous and we heart you so much,too. Thanks for sending a card to “B”! YAY, LORI! YOU ARE AWESOME, THANK YOU. This is Joanna’s baby. Her creation. So glad she’s doing it. Victoria – Congratulations to your father. How is your cousin doing? Is s/he holding up okay? How are you doing? Thank you so much for all of your incredible support, and for sending a card to “B”. What a fabulous, giving, considerate, kind gesture. Thanks, Joanna, for initiating this. I’m on it and I will have my son make her a card as well. Please send my love and best wishes to “B”, my heart is aching for her. Joanna, loved your words once again. I chose the go it alone route which was probably a bad choice but the first few people did not get it so I closed myself off to deal with it my way. Of course, DT did not exist then but it does now and we need to rally. If I can help in any way please do not hesitate to let me know. I’m in Pittsburgh, PA.
Yogichick, I echo your sentiments completely. Thank you so much for sending a card. You are a honey. A million thank you’s. Yes, this community is awesome. YOU ALL ROCK MY SOCKS OFF. ha. I agree–this is an awesome community, thanks to all you wonderful peeps! DAT; You are so fabulous! I wish you didn’t have to go it alone back then. I wish the people you bravely opened up to were a lifeline. You didn’t deserve to go through that. Thank you so much for sending a card and asking your son to make one, too. WOW. love that. So sweet. Thanks for extending yourself to “B” and Joanna. Once again, I’m rendered speechless by this remarkable community. DAT–a MILLION thanks to you and your son!! You’re both wonderful! The have at it alone route is tough, isn’t it?! I understand why you chose that route at first, though. Glad you’re part of this community now! what about our buddy, Gina Marie? any cards need sending her way? I’ll add this to my list as well. Thanks for the opportunity to try and cheer & bless someone else! Thank you SO MUCH, Bee, for your show of support. It’s so very appreciated. Jen, thanks a million. Much gratitude to you for supporting B. My card will be in the mail shortly too, I promise !!! Katie, please pass this on to “B”. —– I had thyroid and throat cancer and a nasty skin cancer – all within 6 months. No matter how old on is, and no matter how you slice it or dice it, Cancer is very very frightening! – Been through chemo treatment and had radiation treatments twice. – Of course I don’t know her exact medical situation, but I can relate to what you are going through. – If I can be of any assistance, please, please email me and I will talk to “B” directly via email or on the phone. HD, thank you so much! I appreciate you reaching out to B. I’ll most definitely make sure she gets your message! So grateful for you and the support you’re giving to B. What an amazing show of support! Joanna, you’re so rad for starting this, I’m a big ball of love right now! All of you are my heroes – my card will be in the mail soon. got it couldnt wait til tomorrow. ive been hitting a very emotional time. it really didnt hit me till night before last, omg i have cancer…. what the heck, ive been balling and yes ive been beseeching too, ill keep that to myself, but ive been a huge mess the last two days. so today as i took my son, my angel to his last day of school i started to freak out. i havent spent any time alone since my diagnosis last monday, so once he was out of the car and i was on the road, i turned into a bowl of moosh, i balled , screamed, yelled, which we all know when your having probs like ours thats not such a good idea, must preserve the voice,lol. my hubby called and said he senced i was in turmoil, boy was he right, i freaked out on him and we cried together. see weve been putting on this happy face and not really dealing with the darn cancer till now, so this was good. anyways long story kinda short, i did lots of retail therepy and while i was out i made sure i got “B” a very special card, it will be in the mail tomorrow for sure.i hope with all of our support she will pull through this with flying colors. its a rough road, i know this has been a long journey to get to this point for me and this is just the begining.please when you wonderful people think of “B” send a lil smile way, i am now having some coping issues. thanks all for listening. gotta go get my lil dude from school..
and tons and tons of healing thoughts from me. Hi Gina, I only did that in private too, Nicholas was only 5 and he was forefront in my mind always, had to be strong. I’m glad your husband is there for you to lean on but please remember that we are too. You are so strong but you have to let it out. You know where to find me. Aww, big hugs and let us know how things progress each step of the way if you are up to it. I will be thinking about you, but I can’t promise I will always smile but I will try if that is what you want. It is very emotional. Gina, you are so wonderful. I think your feelings are completely normal. It took a long time for me to fully realize I was dealing w/ cancer, too. Cry those tears when you need to…don’t keep your happy face on all the time. This is a time where you have to do what’s right for you. If screaming at the top of your lungs will make you feel better, then go for it, girl. Dear Thyroid is cheering hard for you, too, Gina! I will get my card in the mail today. This is such a great idea to show our support. Thank you so much Joanna for coming up with this. Thanks so much, Christina. You’re so awesome!! Phillip, thanks so much for your generosity! 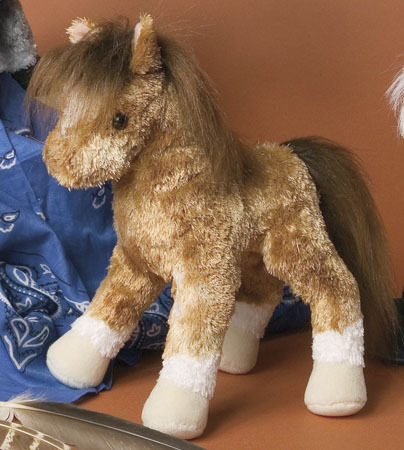 I think B might be a little old for the plush pony. I know I did say she’s our youngest community member, but I believe she’s perhaps outgrown the stuffed animal phase. 🙂 Thank you SO MUCH for your willingness to reach out to B.
Joanna what a lovely thing to do. My thoughts and healing vibes go out to B and Gina. I will try and get a card out ASAP but you know how snail mail is across the pond and at times they just don’t turn up at all to my annoyance. Thank you, Lolly. You’re just wonderful!